I’m no stranger to VR shooters, but I must confess that I’ve never played a shooter that required me to remain sitting, so I wasn’t entirely sure what I would be getting myself into with Blood & Truth. Born out of The London Heist, one of the mini experiences included in PlayStation VR Worlds, this PSVR shooter is played seated with the Move Controllers, and it fortunately features a pretty easy to pick up movement system. Your way forward is indicated by move markers, and you can simply look where you’d like to go and press the move button to advance to that area. It’s a pretty solid system, and it does a good job of compensating for the fact that the Move Controllers are completely lacking in thumbsticks and d-pads. Once you start moving to a node, you’re committed; you can’t back up or cancel the move if you realize you’ve made a poor decision, but you still retain full use of both arms while moving, so you can at least go hyper aggressive and kill your ambushers while on the go. You can also use the side buttons to strafe between two movement nodes, moving from cover to cover to get a better vantage point and take out your target. While you do retain control over where you move and when, you cannot decide your speed, nor you can you backtrack. The slow movement helps prevent motion sickness, which is a big plus, but between the predetermined nodes and the ever-onward nature of the game, it felt a little bit like I was on rails, and I certainly didn’t have the ability to explore. You have access to two weapons at all times, a handgun and a heavy weapon; the handguns are holstered on your hips while the larger weapon is slung across your shoulder. Both can be holstered and drawn easily. You also keep a seemingly unlimited supply of ammo strapped to your chest; everything being placed in distinct locations works very well for this title. Never once did I grab a weapon when reaching for ammo, I was able to remember what lived where, and the censors were never confused about what I was reaching for. That said, I’ve been spoiled for so long with arcade reloading that this served as a stark reminder of just how quickly you can run out of bullets. I kept dropping my clips, as you have to keep a grip on them, unlike your guns, which stay in your hands after you pick them up. Other than that, the whole process was pretty slick. I started the level with a submachine gun, and was able to swap it out mid-level for a shotgun. Hell yeah, a shotgun! As much fun as it was using this to literally blow my enemies away at close range, I quickly regretted my decision because of the reloading, and often found myself scrambling to reload my two hefty bullets while enemies with handguns unloaded much larger clips at short range. Ouch. One of my favorite features of Blood & Truth turned out to be the Focus mechanic. By pressing both move buttons, you can slow down time, allowing you basically step into the Matrix to pull off amazing kill shots and dodges. Focus is not unlimited, though the exact nature of the mechanic isn’t entirely clear. It runs out after a while, and seems to take a bit of time to recharge. Because there was no visible gauge or indicator, it’s hard to judge exactly how long the duration and recharge times actually are. The game also recognizes the placement of your off hand in relation to the weapons. It actually recognized when I brought my left hand up to steady my pistol, and moved the hand to ‘cradle’ the grip. As cool as this was to see, I feel that PSVR games in general tend to lack this kind of delicate touch where hands are concerned, it didn’t seem to have any real impact on gameplay itself. Between the time boost from Focus, which allowed me to take my time aiming, and the lack of kickback from any given weapon, I tended to keep my left hand close to my chest to allow for faster reloading. But enough about combat, there’s more to this game than just shooting people, as much fun as that is. 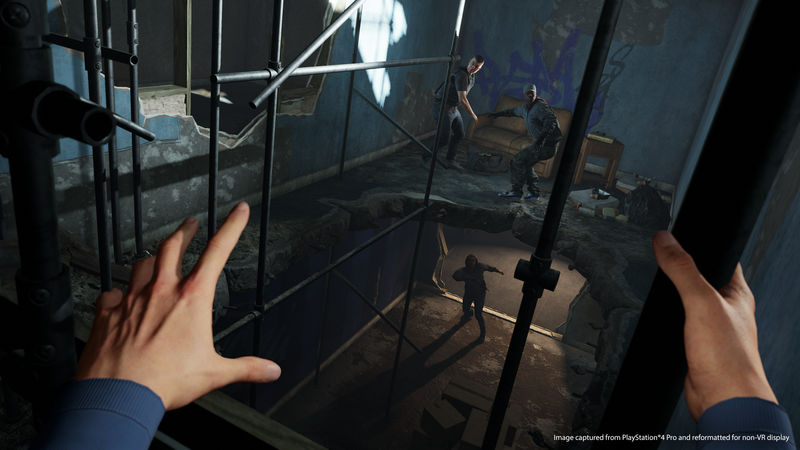 Blood & Truth has a prominent story, allows you to climb your way up ladders, across ledges, challenges you to try your hand at picking locks, fix busted fuses, and even allows you to flash obscene hand gestures at those trying to kill you. It’s a nice way to break up all the killing, and helps prevent this from becoming just another shooting gallery. Picking locks, in particular, was a nice distraction, though I did need a bit of guidance to get started. First, I dropped my tools twice due to the fact that, in this game, once you pick up a gun it stays in your hand, but this is not true for literally anything else. Once I got used to the fact that I had to keep my grip, I had to get used to the idea that I had to go slowly. Very slowly. Taking your time feels a bit at odds with the fact that you just infiltrated a building and loudly killed dozens of people. Without any kind of threat that someone might follow the trail of corpses and open fire on your back, you carefully place your tools into the locks, then turn them slowly, twisting carefully until you see the tumblr drop into place, vaguely similar to the Safe Cracker game in 1-2 Switch. The demo skipped over a good chunk of the level in the interest in time, and allowed me to watch a short scene of the main character interacting with his kidnapped mother. He may be the one who just shot up half of London, but it was pretty clear that she’s also tough as nails, cool under pressure, and likely taught him everything he knows. I enjoyed their banter, and that little taste left me eager to learn more about the story behind this VR shooter. Blood & Truth is being developed exclusively for the PSVR by SIE London Studios. While there is not yet a firm release date, it should be coming sometime in 2018. Stay tuned for more E3 coverage, coming soon to your friendly, neighborhood Gaming Trend.